I wrote this blog a while back to promote my Sleep album from Guided Meditation Treks. It sat on my hard drive for a while, and I've moved on to other albums since then, but I've still remained an avid lucid dreamer. These are the secrets I've uncovered in researching and experiencing this topic for many years. If you're not familiar with the concepts, a lucid dream is a dream where you know you are dreaming. Once you become lucid in a dream, you can become a conscious creator of it. Imagine yourself in a world where anything is possible – a world where the physics of earth do not apply. It’s not only a world where the repercussions of an action have no (known) physical consequences, but it’s also a world where you can have just about any experience delivered to you at will. As a lucid dreamer, it becomes possible for you to visit unimaginable places in your dream and even co-create the dream itself! An out of body experience is similar in that the steps to induce it are similar, but the difference is that your consciousness remains in some version of the physical reality instead of the dream world. Here are the secrets to go to these places! As a white male, I've grown up with a level of priveledge and entitlement in this world which had led me to rarely question my advantages, but worse, sometimes question the plight of those who mostly experience disadvantage and discrimination -- the total opposite of privilege and entitlement. As a person who, above all, strives to serve the greatest good of others and the greatest good of all, this is an unacceptable state. Fortunately, after being in a long-term relationship with a person of color, I've had the blessing to be able to gain a better understanding of how the dichotomy of skin color separates us in subtle ways, and how we still to this day create unfair advantages for ourselves, even in states of ignorance when we are trying to help. In this blog, I explore various ways that we, as white people, create these disadvantages, as well as how we can transcend beyond the lip service we give to people of color as we all try to erase separation and truly treat each other as equals. Why Do We Forget When We Reincarnate? Living in this world as an individual whose life is a set of linear experiences over time, we may fall into the trap of seeing things only from our own point of view, unable to see the other side of an argument because of our own lack of experience. This is compounded when we surround ourselves with others who have only had similar life experiences, resulting in an echo chamber that amplifies our own beliefs and reassures us that our positions are the correct ones. A simple example of this can be shown any given day on social media, where we argue about concepts that have been neatly placed into dichotomies that force us to “pick a side.” Without a variety of life experiences, it becomes easy to pick one of the sides and then get swept into an argument where we disregard the experience of others, which may be different than our own. My first smartphone apps were these basic tools to allow users to create their own binaural beats. The app was called Binaural, and this past December, I made both the iOS and Android versions free for anyone to download and use. Now, I've decided to take this a step further and make the core of these apps open source! This means that you can go to my github page and download fully working sample apps that generate binaural beats and isochronic pulses. Then, you can use these algorithms in your own apps. 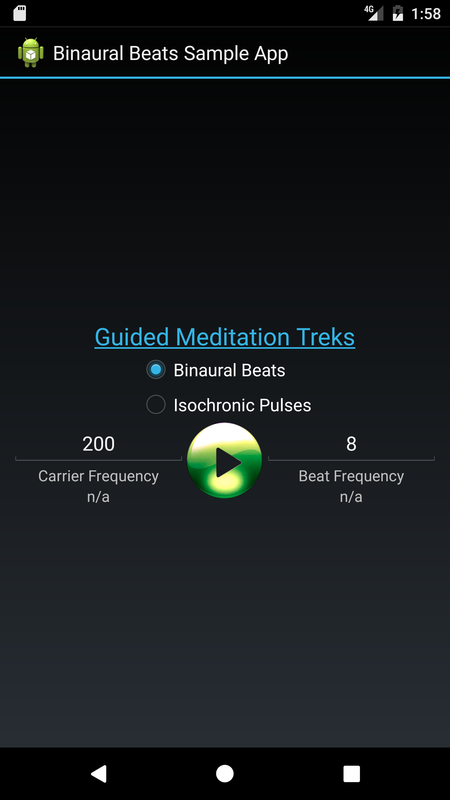 If you find any of this useful, I'd appreciate you give me shout, and perhaps I'll feature your app on my Guided Meditation Treks blog! Or you can just download the app and not worry about how it works! I've been doing software development for a long time, and recently, I've been working on some newer stuff with my startup, Synervoz. We are creating cutting-edge technology to bridge gaps in the realms of music and talking with our app TurnMeUp. For example, how many times have you been listening to music with earbuds or headphones when someone in the room is trying to talk to you? Our app lets you hear them without taking off your headphones. Not only that, but our technology lets people not in the room to talk to you in real-time without making you answer a phone call or interrupt that important Jamiroquai song you are listening to in the moment. Here is an outline of some of the technologies I've worked with on this project (and otherwise), which I find to be some of the most relevant technologies in the 2010's, yet they didn't even exist ten years ago!